NoSQL databases are now commonly used to provide a scalable system to store, retrieve and analyze large amounts of data. Most NoSQL databases are designed to automatically partition data and workloads across multiple servers to enable easier, more cost-effective expansion of data stores than the single server/scale up approach of traditional relational databases. 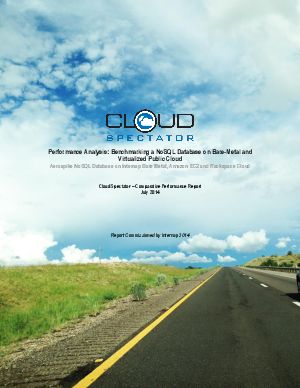 Public cloud infrastructure should provide an effective host platform for NoSQL databases given its horizontal scalability, on-demand capacity, configuration flexibility and metered billing; however, the performance of virtualized public cloud services can suffer relative to bare-metal offerings in I/O intensive use cases. Benchmark tests comparing latency and throughput of operating a high-performance in-memory (flash-optimized), key value store NoSQL database on popular virtualized public cloud services and an automated bare-metal platform show performance advantages of bare-metal over virtualized public cloud, further quantifying conclusions drawn in prior studies. Normalized comparisons that relate price to performance also suggest bare metal with SSDs is a more efficient choice for data-intensive applications.